If you want to download the complete newsletter in PDF, click on this line. In 2019, USBC is launching The Power of “1”. The number “1” is key to setting and accomplishing strategic goals for the church in this coming year. The number “1” in the Bible is very significant. This stand-alone number has two unique characteristics in the Bible. First, the number “1” is a testimony to the uniqueness of God and the Christian life. Second, the number “1” is a vivid description of the importance and value of Christian unity. Therefore, the goals that our church will set for 2019 will begin with the number “1”. In addition, we as a church body will become one in spirit and service to accomplish such goals. List below is the structure for The Power of “1”. 1 = USBC will have at least one baptism in 2019. 100 = USBC will have at least 100 new people visit our church in 2019. 1000 = USBC will have at least 1000 new contacts in 2019. As we reflect upon the goals listed above, it is important to note that these goals range from easy to challenging. However, each one can be accomplished if we give our best to the Lord. Below is listed a simple, but effective approach for how we can meet these worthy goals. 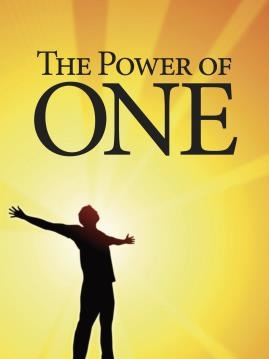 For The Power of “1” to become meaningful, real, and effective, each one of us must do our part. Our Ministry Teams will work in concert to help achieve these goals. When such ministry activities are being planned, it is imperative that the Ministry Teams keep in mind the goals that are laid out in The Power of “1”.